You've heard of white elephants and red herrings, what about pink grasshoppers? Well, we managed to find one here at Carymoor! Last week we had a staff day, a sort of team building session really - not that we need one as we all get on so well. It was more an opportunity for those staff who are involved in waste management to learn a bit more about the ecology of Carymoor. Whilst we were raking hay in one of the experimental grassland regeneration plots, Angus our Site Ecologist, imparted pearls of wisdom on best management practise in creating wildflower meadows. In mid to late summer the meadows at Carymoor are buzzing with the sounds of grasshoppers and crickets. I wasn't entirely surprised to find a pink grasshopper in the area I was raking - I distantly recall having come across an article about such a phenomenon whilst researching Field and Meadow grasshoppers on the internet. According to BBC News, an eleven year old boy found a bright pink grasshopper near Sidmouth in September 2009. The local Ranger explained the colouration as a rare genetic mutation. A further feature from BBC Liverpool described pink grasshoppers at Pickering Pasture near Widnes. 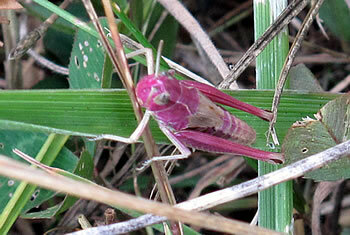 Ranger Rob Smith believes that the pink is the juvenile state of the grasshopper. "They remain pink while they are young, partly as camouflage but also because they're deep in the vegetation and are not going to be seen easily." 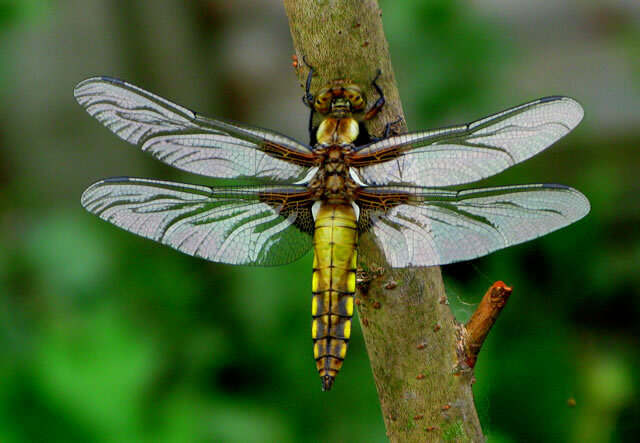 "As they reach maturity they change to a green and brown colour." 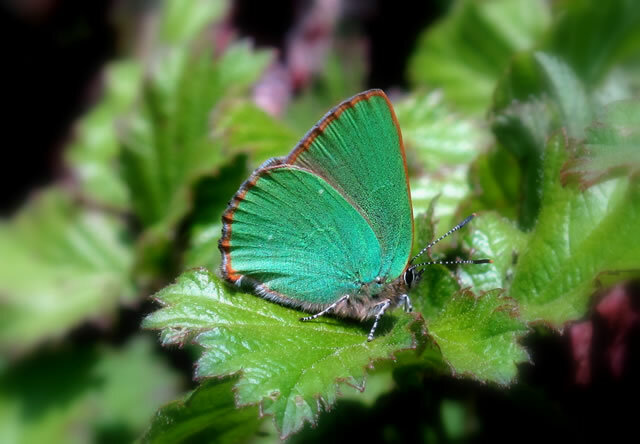 During 2009 and 2010 a number of sightings have been made around the country. 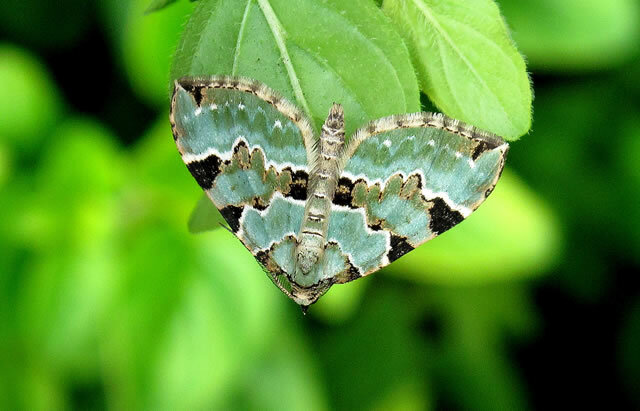 Often they are described as mutations- as with the Sidmouth specimen, but Professor Greenwood of Portsmouth University commented that as well as changing colour with age they can change colour due to infection or diet. Whatever the reason for his colour, spare a thought for the pink male grasshopper and the taunts he must endure from his alpha-male colleagues! While I was putting away some tools in the tools' store the other day I noticed a loud buzzing around my head and was considering taking emergency evasive action when I managed to get a closer look at the insect as it settled on a bramble blossom. 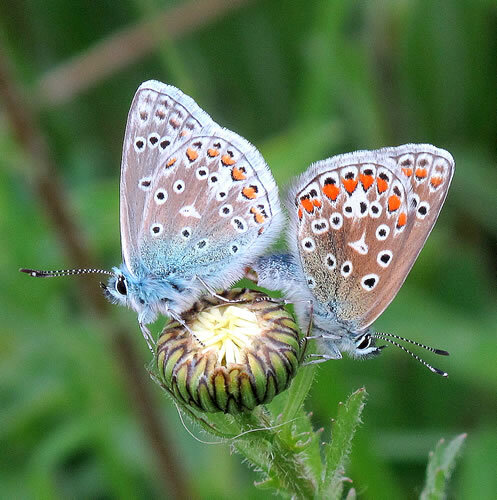 I then realised what it was, having encountered the same species on Portland a few years ago. 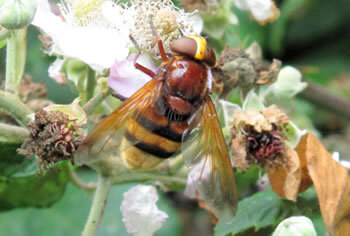 Its popular name is Banded Hoverfly - Volucella zonaria. The genus Volucella represents the largest of our hoverflies and many are Bumble Bee mimics. Zonaria is actually a hornet mimic which accounts for my instinctive reaction to put as much fresh air between it and me in as short a time span as possible. So please bear in mind, next time you brandish a fly swat or wave a can of wasp killer at a large buzzie thing that comes too close, consider whether it might be a harmless hoverfly that deserves to be left to go about its important business of pollinating flowers - especially in the absence of so many of our honey bees. 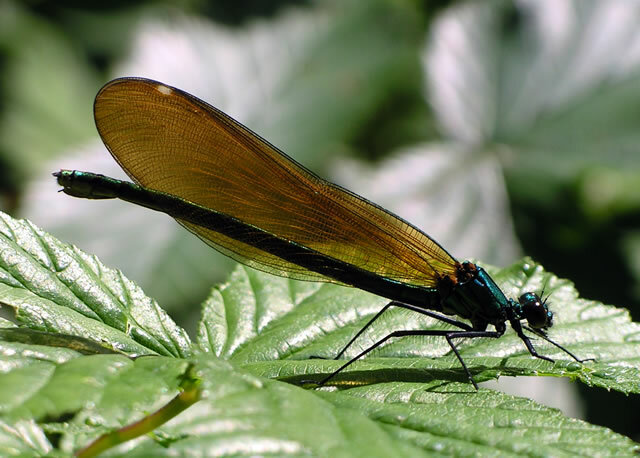 I often find when using the internet to study a particular insect, about half the websites contain interesting facts about its ecology and lifestyle; the other half tell you how systematically you can "nuke" it with their product! Distinguishing between hoverflies, bees and wasps isn't always easy until you get your eye in. Hoverflies have much bigger eyes and smaller antennae than bees and wasps, they also have much flatter abdomens. They have evolved through natural selection to mimic wasps, bumble bees and hornets as a highly effective form of self-defence. No would-be predator is going to mess with you if he thinks you are going to sting him. Unfortunately this is not the case with the average Homo Sapiens who is almost certain to annihilate you if he perceives you to be a threat! The Banded Hoverfly is notable not only for being a very clever mimic but also for being a relatively recent coloniser of southern Britain from the continent - like our resident Wasp Spiders, quite possibly as a consequence of climate change. Here are six other shots he has taken of local insects and spiders. Well done on the very clear images that you have taken. Great article! Love the place! I agree - lets stop nuking our little creatures.